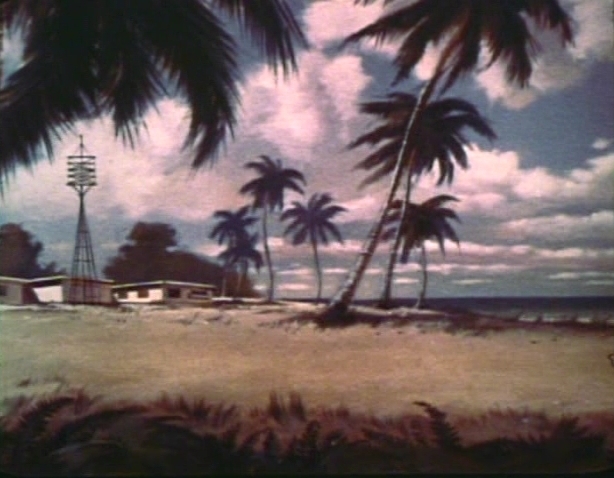 Palm Key Although Palm Key remained "home" through-out the series, not every episode had scenes that took place there. Dr. Quest's home. Although not stated specifically, this small island is presumed to be somewhere off the western coast of Florida, still in US-protected waters. Small islands such as these are numerous near Florida, and are traditionally called "keys" (ex: Key West, Key Largo, etc. ); the environment has a tropical or sub-tropical climate, with abundant sandy beaches. 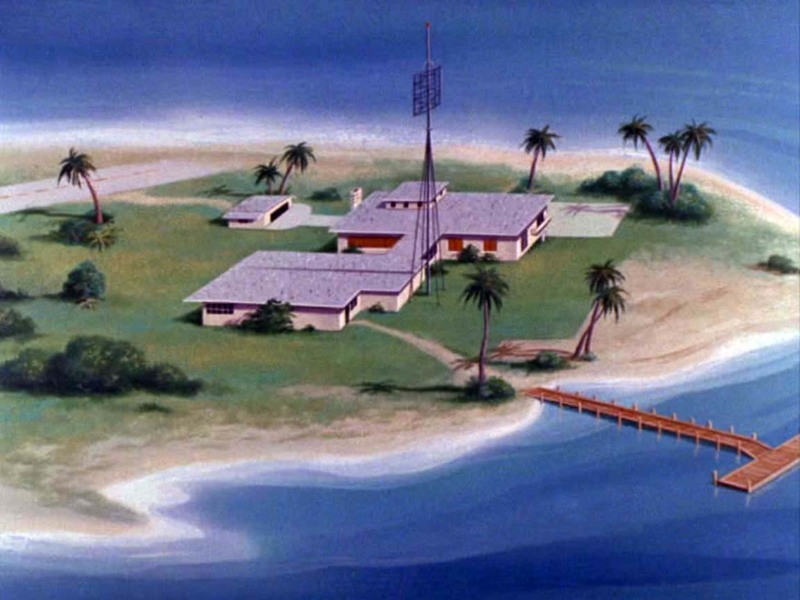 On Palm Key are several multi-storied buildings with flat roofs; at least one of these buildings serves as Dr. Quest's lab. Presumably others are living quarters and supporting facilities. There is an airstrip on the island, with associated hangars; presumably boat docks are present as well, since Dr. Quest seems to have an oceanic research vessel (the Sea Quest) and hydrofoil as well as at least two planes. The Sargasso Sea The Mystery of the Lizard Men The Sargasso Sea is an immense area off the coast of Georgia and the Carolinas in the North Atlantic. The visibility of the "man to the moon" launch, presumably from Cape Canaveral in Florida, suggests a locale in the southwestern portion of this area. Somewhere in the Arctic Ocean, presumably north of Alaska or Canada. Arctic Splashdown The Quests arrived at the site mainly via an icebreaker ship. The rocket crashed into an ice flow, and was surrounded by water. Egypt, near the ruins at Ghiva The Curse of Anubis Near some ruins at Ghiva, across the border from the oasis El Khabir. South America or possibly Africa Pursuit of the Po-Ho In the midst of the jungle. India, Jahilipur province The Riddle of the Gold Being able to see Mt. Everest from the train suggests this province is in northern India. On the map, Race points to a spot in north-central India. southern Mexico or Central America Treasure of the Temple The temple was of Mayan origin, suggesting either Central America (Guatemala or Honduras) or southern Mexico (Yucatan). Dr. Quest called the lost city by the name of Malatan. India, Calcutta Calcutta Adventure In addition to spending time in Calcutta, also travelled to the northern mountain region of Sabat, about 2 hours away from Calcutta. northern Thailand, near Chiangmai Double Danger Chiangmai is where Zin told Korchek the Quests would be found. South America, somewhere in the Andes Shadow of the Condor Reference was made to the Chilean government. However, Race was going to fly one of the baron's planes to La Paz which is in Bolivia (Thanks to John Naureckas); see also these thoughts sent by Frederico Garcia from Brazil which suggest additional reasons why the location may have been in Bolivia. somewhere in the Caribbean, near the Bahamas Skull and Double-Crossbones The presence of 17th century Spanish shipwrecks as well as British naval vessels serving as the local coast guard seem to indicate a Caribbean location. 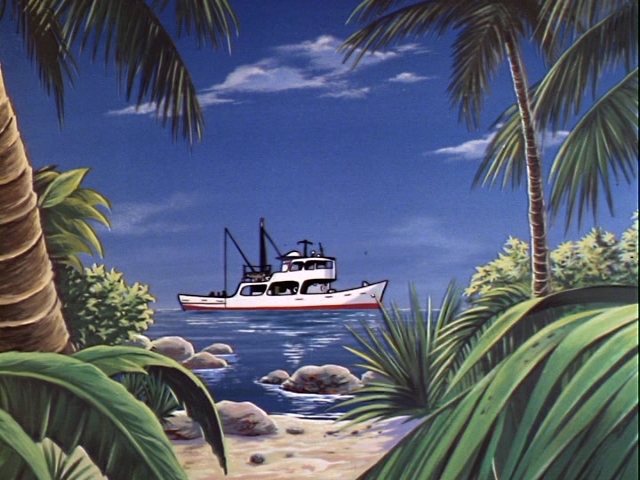 Also, the working title of the episode was "Bahama Treasure", which nails down the location pretty well. Brazil, South America A Small Matter of Pygmies Somewhere in the southeast portion of Brazil, according to the map location specified by Dr. Quest. South America, presumably somewhere in the Amazon basin Turu the Terrible There is a jungle setting with large mountains nearby, with a local Indian population, suggesting the upper Amazon river basin. an island in the South Pacific The Fraudulent Volcano The presence of volcanic activity suggests some place along the Pacific "ring of fire". Mount Tahawa was mentioned as the volcano's name, and Race called the island Bahiti as they flew in to meet with the island's governor. Canada Werewolf of the Timberland French-Canadian dialects suggest Quebec; presence of a native American suggests somewhere a bit further west like Saskatchewan or Alberta. Dr. Quest mentioned the Ottawa government as the ones who requested his presence. near Palm Key, in the Caribbean or Atlantic Pirates from Below There was a secret base, mostly underwater but with an island exit tunnel, nearby; presumably outside U.S. waters. Africa, somewhere near the west coast Attack of the Tree People The presence of anthropoid apes and a dense jungle bear a strong resemblance to the place where Tarzan spent his formative years, somewhere along the west coast of Africa. A place called Umphiti was also mentioned. 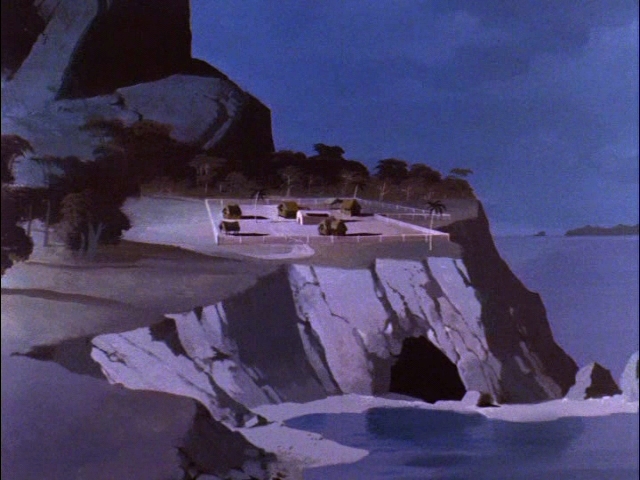 Cave Island, a remote tropical island, probably in the Atlantic The Invisible Monster Cave Island was no tiny islet; when the Quests approached in their plane, at first all they could see was the western tip; they flew a little while further to reach the eastern end where Dr. Norman's lab was located. Flying over the island, they saw mountains and quite a bit of jungle. 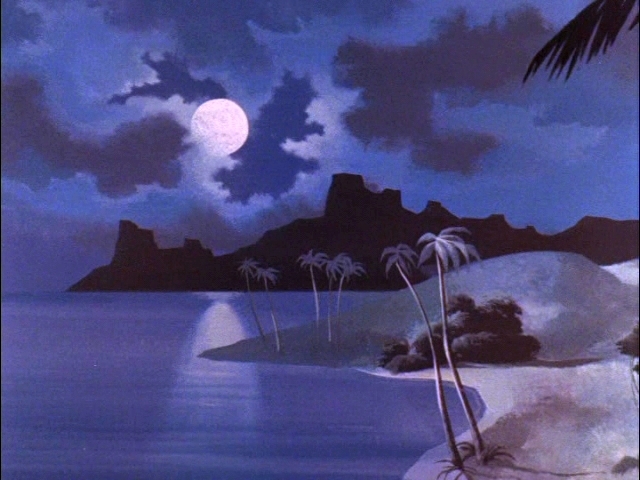 In some of the scenes of the island, near the beginning of the episode and when the Quests approach in their plane, we see a number of the neighboring islands in the background; some of them look to be volcanic in origin and rather large as well. Cave Island was probably also volcanic in nature. The island was apparently inhabited by a small native population, enough for several villages. The natives appeared to have an ancestry other than African; the one we saw looked Polynesian or perhaps Asian. But most clues hints at an Atlantic locale instead of a Pacific one: First, the Quests left from Florida and presumably flew straight to the island, arriving over the western tip of the island first. That is, they approached from the west or northwest (they were flying east or southeast), and both the Pacific and Indian Oceans would probably be too far away if flying in this direction. So the most likely location would appear to be somewhere in the southern Atlantic ocean. A second clue is that Jonny and Hadji slept throughout most of the trip, waking up near dawn. If flying westerly, the "night" would be very long, much longer than would seem reasonable, since they would be following the sun. Flying eastward would make the night much shorter, possibly just a few hours (they are flying to meet the dawn rather than fleeing before it). This seems a much likelier situation, and also points to an Atlantic Ocean destination. (image courtesy Paulo Brandão) The Devil's Tower The landscape appears to be mostly savanna, with the Devil's Escarpment apparently an ancient volcanic formation (hence the presence of diamonds); the presence of these gems suggests a locale in or near South Africa. A place named Kooba-Bahn is mentioned as the place where Race might try renting a plane. Quetong, China The 'Q' Missile Mystery This location was apparently near the Chinese seacoast, as the Quests were originally aboard a ship. (images courtesy Paulo Brandão) The House of Seven Gargoyles Somewhere along the deepest, narrowest fjord in Norway, near the Strondheim glacier. Most of the episode's action takes place in a castle there named Raklev Castle. Hong Kong, and Moy Tu, an island just south of Hong Kong. Terror Island Moy Tu island had an elaborate laboratory and power station, and was located less than an hour from Hong Kong. Khumjung, Nepal Monster in the Monastery A small outpost in the Himalayans, near Mt. Everest, where the legend of the yeti holds sway. In the Pacific Ocean (the Java Sea) The Sea Haunt The last known position of the Star of Borneo was in the Java Sea, 200 miles due north of the Linga archipelago.